← Cloud HTML Screenshot API. Screenshots as a service. Automate screenshots of any website. The best, most accurate HTML screenshot API. Display HTML as image anywhere in minutes. Extract Data From Standardized Contracts and Automate Your Business. Extract Data From PDF Invoices and Automate Your Business. Extract Data From Scanned Invoices and Automate Your Business. Extract Data From Shipping Orders and Automate Your Business. Extract Data From Bank Statements and Automate Your Business. Extract Data From Purchase Orders and Automate Your Business. Extract Data From Generated Reports and Automate Your Business. VeryPDF Cloud PDF Data Extractor is a data capture solution built for today's modern cloud stack. Automatically fetch documents from various sources, extract the data you are looking for, and move it to where it belongs in real-time. VeryPDF Cloud PDF Data Extractor boils down business documents to the essentials and moves the extracted data to where it belongs. Say good-bye to manual data entry and automate your business. Say good-bye to tedious and error-prone manual data rekeying. VeryPDF Cloud PDF Data Extractor offers fast, secure and accurate document data extraction tools to automate your document based workflow. Getting billed by the same vendor on a regular basis? VeryPDF Cloud PDF Data Extractor makes it easy to pull relevant data from invoices such as the reference, dates, totals and line items. Are your purchase order files in PDF or paper format? Our document parser extracts data from purchase orders, and moves the data directly to your order management system, or wherever else you need it to be. Efficiently and reliably extract key data from rental & leasing contracts, warranty & insurance agreements, or from any other form based contracts. You can efficiently and reliably extract tables from PDF product lists for input to your POS, eCommerce site or good old Excel. Even parsing scanned documents is no more a problem with our built-in OCR PDF Scanner. Reliably convert credit card and bank statements to Excel or any other structured data formats. Once converted, transactions can be downloaded as spreadsheets or automatically moved to your accounting system. Extract data from PDF forms fields, in bulk, with our batch parsing software. Automate your PDF form processing for download, or integration to wherever you need the data. VeryPDF Cloud PDF Data Extractor can automatically fetch PDF files and scanned images from various sources for you. You can connect your cloud storage provider (Dropbox, Box, Google Drive, OneDrive), use our REST API, email your files in as attachments, or simply upload them with our secured application. Our parsing engine extracts relevant data fields from your document based on parsing rules which are 100% tailored to your needs. Creating parsing rules is easy and requires zero coding. 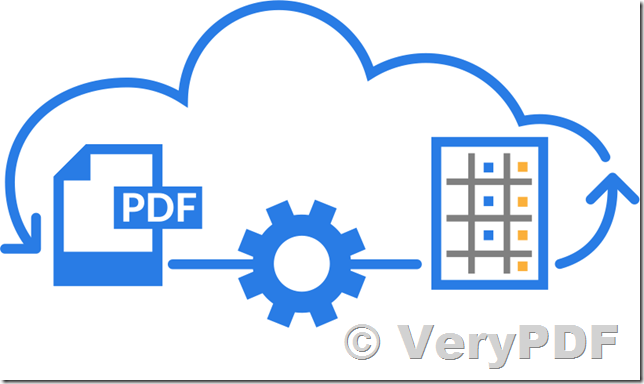 VeryPDF Cloud PDF Data Extractor can identify and extract data using Zonal OCR technology, advanced pattern recognition or with the help of anchor keywords. Once set up, new documents are automatically processed and you'll get structured and easy-to-handle data in return. Build a customized document capture and data extraction solution within minutes. Convert PDFs or scanned documents to data in any format with fast and easy setup... no technical skills or coding required. How to annotate secure PDF files free online? This entry was posted in VeryPDF Cloud API, VeryPDF SDK & COM and tagged extract data, pdf to table, pdf to tabular, pdf to text, pdf to text ocr. Bookmark the permalink.